If you are a knitter, you will understand completely what I am about to say. You will sympathize, empathize. You will say, I feel your pain. Been there, done that. First a little background. I am working on Kinsale, which is a textured sweater designed by Alice Starmore that is found in the book Fishermen’s Sweaters. Like so many of Starmore’s designs, it is knit at a very tight gauge. I started Kinsale quite a while ago and finished the back and the bottom band of the front before I set it aside to work on other projects. As you can see in the picture, instead of a ribbed cuff, Kinsale has a welt that is made up of a pattern of purl two rows, knit two rows. So, today I pick up Kinsale and start knitting. I think to myself that maybe I ought to check to see if my current gauge matches the gauge I got when knitting the back lo these many months ago. I hold up the completed back to compare it to the front, and something just isn’t right. At first I cannot figure out what it is. The gauge seems fine on both pieces. Then it jumps out at me like a bolt out of the blue. The welt on the front piece had one more pattern repeat in the welt than the back piece. Yikes! I look at the instructions in the book and realize that I had indeed left out a four-row repeat when I knitted the back. What to do? There are several options. 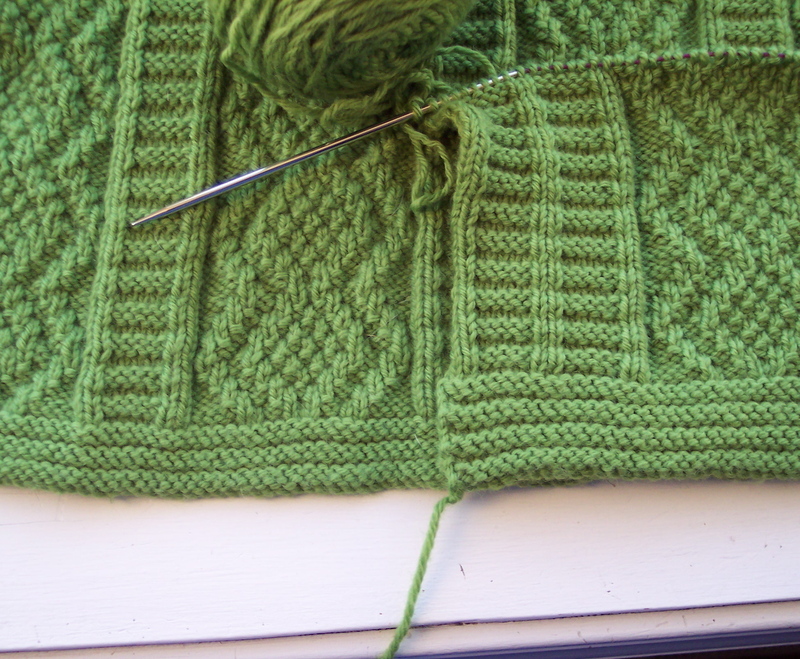 •I can pick up the stitches of the first row of the welt on the back piece with a circular needle, snip the cast-on and pick it out, then knit another repeat of the welt pattern and cast off. Yep, that’s the ticket. I’ll do it that way.